Kentucky is famous for delicious bourbons and beautiful thoroughbred horses. Head out on the Stills and Stallions tour to experience the best of the Bluegrass. You'll journey along a fence-lined Kentucky back road to Old Friends Farm to talk about the history of the industry, tour the stables, and see their thoroughbreds. You'll take a trip down the bourbon trail to savor Kentucky’s native spirit at Buffalo Trace. You'll learn the art and science of bourbon making as you tour the facilities and learn the history of the famous industry. The tour will conclude with samples from the distillery’s selection of spirits. 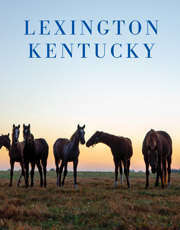 Pick up will be at the Lexington Visitors Center or Keeneland. Tour is approximately 4 hours in length. Water and snacks are provided. Price includes transportation, fees for the horse farm tour, tasting and tour at distillery and water and snacks.